Depression is one of the most commonly reported mental disorders in the United States. Research however, has examined the relationship between food and the brain and identified several nutrients that can help manage depression. Calcium, chromium, iron, omega-3 fatty acids, vitamin B9 (folate), vitamin B6 (pyridoxine), vitamin B12(cobalamine), vitamin D, and zinc have all been identified as central to mood management. These nutrients can be found in the foods featured in this article, which are widely available at most grocery stores. For optimum results, combining a healthy diet with therapy is recommended. Read on to discover how to improve your mood. Walnuts are a good natural source of omega-3 fatty acids. Those with depression tend to have low levels of this nutrient therefore, supplementing treatments with omega-3 sources can help improve mood. 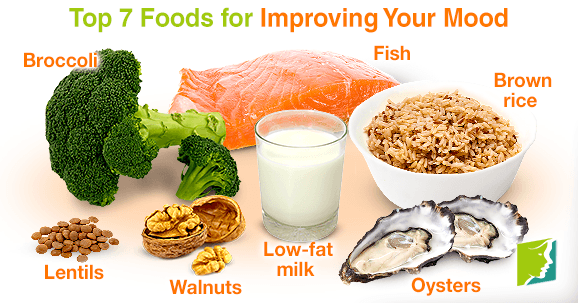 Salmon, trout, and sardines also provide excellent sources of omega-3 fatty acids. Studies have shown that women who have a higher omega-3 fatty acid intake are less likely to experience depression. Oysters have one of the highest zinc contents found in food which makes them great for fighting depression. This is because, zinc has antidepressant effects which complements other treatments for depression well. By producing more of the amino acids that create serotonin - a mood-regulating neurotransmitter - complex carbohydrates help improve mood. Oats and whole wheat pasta are good sources of complex carbohydrates. The International Archives of Medicine found that women suffering from depression were often vitamin D deficient. In addition to being calcium rich, milk is a great source of vitamin D, a nutrient which helps improve mood, especially in cases of premenstrual depression. Broccoli and collard greens are packed with vitamins B6 and B9. Vitamin B6 has been shown to help manage premenstrual depression in some women. It can also benefit those suffering from general depression as sufferers often have low levels of B9. Broccoli is also a great source of chromium, a substance which can help relieve atypical depression. Iron deficiency plays is partially responsible for triggering conditions like depression, fatigue, and anemia. Legumes like lentils however, are rich in the iron which can help counter deficiency. Lentils are also rich in essential fiber and protein. Studies have been conducted on the relationship between food and the brain, and show that certain nutrients may improve mood. The foods listed above are not only rich in vitamins, minerals, and fatty acids, but are also thought to lessen depression and ease anxiety when consumed as part of a balanced diet. Mood is regulated by the brain, and a healthy cognitive system is vital to feeling happy and healthy. It is also recommended that you exercise regularly in order to improve your mood.